With the recent sale of Minecraft for $2.5 B to Microsoft, the brand is in no danger of losing steam. It’s even expanded into toys, film, and books. Recently, I had the privilege to speak to the author of one of the Minecraft novels on the market, MTV journalist Danica Davidson. Her day job may be covering social justice issues at MTV, but when she comes home at night she authors Minecraft novels. Her first, Escape from the Overworld, is already out in print, ebook, and audiobook formats. She is working on a second novel Attack on the Overworld is in production. Both are available to order at Amazon as well to preorder. William Wilson– Danica, thank you for speaking with me today. So, how did you get involved with the Minecraft brand? Danica Davidson– Pleasure’s all mine. I got involved in the Minecraft brand after my publisher suggested I pitch them about it. I’d played Minecraft, I knew Minecraft, I appreciated the versatility of Minecraft … but it had never crossed my mind before that I could write a fictional book about it. WW– What drew you to the Minecraft Universe originally? DD– I like how it lets you be creative and make the game what you want it to be. You can have all the swashbuckling adventure you desire, or you can create your own world, or you can spend all your time building whatever your mind comes up with. Or all of the above. For me, it lets me write fun books! WW– Makes total sense. So, in your opinion, why do you think people love this brand? DD– I think because it really lets you play. A lot of people have compared it to Legos because of the building aspect, but there’s so much more. For one, the building is endless because you don’t have to buy supplies. You can go on adventures and fight monsters like zombies or skeletons. They have “skins” that let you play as different characters, or create your own. So you can get skins for big franchises like The Simpsons, Halo, My Little Pony, Attack on Titan… or you can make your skin look like yourself (except, you know, blockier). There are portals so you can enter different worlds and there’s a whole Minecraft mythology. I’ve heard parents also say they like their kids playing because Minecraft can be used for everything from teaching reading skills to learning chemistry. Whatever it is, Minecraft has it. It’s also fun to play with groups of people, which is typically how I do it. We take turns building while we hang out and relax. WW– Can you tell our audience about the first book, and why should they go out and buy it? DD-11-year-old Stevie lives in the Minecraft world and has been feeling down on himself because he’s not good at building or fighting monsters. He finds a portal to our world and steps out of the computer of an 11-year-old girl named Maison, who’s bullied at school for being different. The two become friends, but because they don’t close the portal, zombies and other monsters from the Minecraft world break through and attack Maison’s school. Stevie and Maison have to put their heads together to save the school and the world from this attack. People should buy it because it has a number of Minecraft elements and cliffhangers, but it also has things real kids can relate to. I went to my old writing from sixth grade to inspire me, and I put in stuff about bullies, about going to a new school, about feeling like an outsider. From my research, it didn’t look as if girls were getting much representation in Minecraft novels, even though girls love video games, too. So it was important for me to have a character like Maison. She’s smart, strong-willed and talented, and there’s a reason Stevie looks up to her. The book has actually be selected for inclusion in an anti-bullying, girl-empowerment curriculum called Saving Our Cinderellas, and it’s all because of Maison. WW– Now you’re in the middle of writing a second novel. Can you tell us a little about it? DD– In the next book, cyberbullies are harassing Maison. She’s become a hero for saving her school in the first book, but the cyberbullies think she knows more about the zombie attack than she lets on. I mean, how do you explain zombies attacking the school? Where did they come from? They hack her computer, realize it’s a portal to the Minecraft world, and start griefing it, turning it to eternal night and unleashing monsters on the villagers. Stevie and Maison have to stop the cyberbullies, but they also have to figure out why they were bullying in the first place. WW– What was the inspiration for writing the second book? DD– The first book dealt a lot with bullying — the in-your-face kind. After I wrote it, I kept thinking, I need to talk about cyberbullying. Cyberbullying can get so vicious and attack people of all ages. I get bullied online for my writing — unfortunately, it seems to come with being a journalist — but I’m an adult, and I can ignore it. I can’t imagine what it’s like for kids to face that sort of thing. It also got me thinking about why kids cyberbully others. I do a lot of writing about cyberbullying for MTV, and I took that knowledge to explore this theme in the second book. I’m hoping it can help kids feel less alone and be able to talk about cyberbullying with their parents and teachers. WW– That’s a really good point, something rarely touched on. Now, when you write, do video games inspire that, or do ideas come from somewhere else? DD– I’d never thought about writing about video games before this. I’d just sold a manga book and my publisher asked if I had any ideas on Minecraft I could pitch for them to consider. 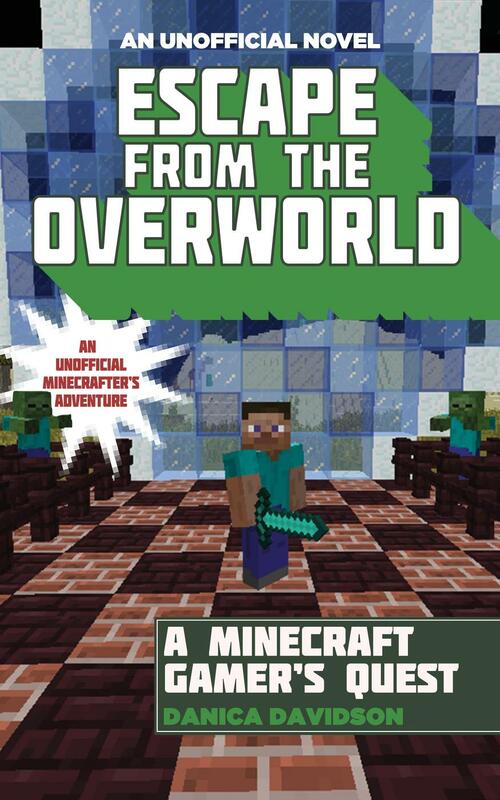 There are a number of adventure Minecraft books out there, I found out, but I wanted to write something that had adventure and important real issues. So I take on bullying, I take on gender roles, I take on universal fears and insecurities. I sent the pitch in through my agent, not knowing what to expect, because it’s not as if the publisher had to take it. They just wanted to see if I had any ideas. But they got back to me almost immediately, wanting me to write the book as soon as possible. They gave me a six week deadline, and I buckled down and got it in while still working full-time for MTV. WW– How has the videogame industry influenced you outside of writing? DD– I grew up playing video games as a kid. I do remember — and this is me being a child of the 90s — that there were some games aimed for boys and games aimed for girls on my Sega Genesis. I would play both, but I would be frustrated because the girls’ games I had weren’t challenging at all, as if they expected girls to be bad at playing video games. The games aimed for boys were much more fun, so they were the bulk of the ones I played. WW– Now apart from Minecraft, what is your favorite video game, and why? DD– I don’t know about having a favorite, but I still do like to get together with friends and play Mario Party on a pretty regular basis. WW– How long do you see yourself writing Minecraft novels? DD– As long as the ideas keep coming and the interest is there. I write novels about things other than Minecraft, but I’m really enjoying how Minecraft has let me build my own book worlds in its universe. WW– Where can people find out more about you? DD– They’re more than welcome to check out my website, www.danicadavidson.com.